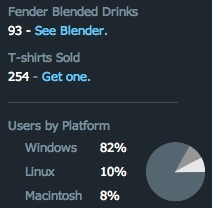 As we are currently in "Developer Preview" mode (like Flock was last year), the Songbird boys and girls decided to count how many smoothies they make in their bicycle-powered Fender Blender, and the other stats you see. Very good idea. The marketing for songbird is top-notch so far, and they're nowhere near a public release. Building geek loyalty early (like Firefox and Flock) seems to be a new trend in applications. They are also advocating actually paying for your music, hooray for them! Since songbird includes the Firefox browser (or most of it), you can go to any webpage just by typing in the address bar. Once you're there, Songbird will show you a playlist of all the media files linked from the page. Pretty nice. It will even try to give you a preview of the length of the song: not sure how it does that without messing with everybody's server logs, but c'est la vie. After getting a handy playlist of everything on a page (even video), you can easily subscribe to all the content on your favorite web page or mp3 blog. Not quite a podcatcher, but better in some ways. A lot of times a more general solution gets the job done almost as well as a niche tool while allowing for, well, more general uses. this is a project I will be watching very closely. I have heard a little bit about it in the past, but now having tried it for myself, the only question I have is "How will they monetize a farting bird mascot?"